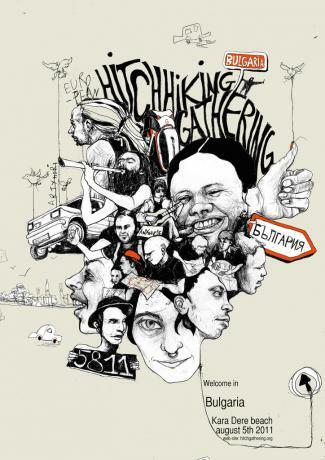 Hitchgathering 2011: Going to Bulgaria! Voting for this year's (and #4 already!) 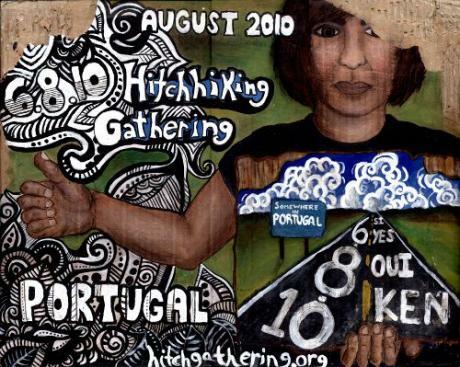 hitchgathering in Europe, taking place at the 5th of August, was great fun again. So many different people putting forward their well-researched proposals but from the beginning the Black Sea coast in Bulgaria got a head-start. At one moment it was even leading with 42 percent! Not any of the other locations was able to come even close to that. It seems also to be the case that another gathering will take place in North-America. Last year saw a small meeting, but nevertheless it took place! This year the date is set for July 15. Location yet to be decided. Check na.hitchgathering.org. The spaceship called Terra Mar that took us allowed me some time to connect to the internet, while Valentina is having her second lesson in surfing waves. So I made it to 'Somewhere in Portugal' on the 6th of August, at exactly the right time. But life took me by surprise and my somewhere was somewhere else than the official 6-8-10 hitchgathering. There wasn't anything I could have done about that. Things are the way they are. I heard many people are already in Lisbon, while others are still on the road. But I have been hitching the whole day. I started before sunrise, with the thumb and sometimes a sign. No petrol station were taken. It was wonderful. The first tumbs up in the morning was a direct hit. Another two times I had to wait an hour or more. But who cares when you have time, and you get your photo taken by a police-officer? Last year we were with just over a hundred. The year before with even more, but the destination was easier and we had done more promotion. This year should become a blast. But where do we want to meet and why? After Paris and Odesa where is next? What are our main aims with yet the third European Hitchhiking Gathering? Do we want to get hundreds of people on the road or do we want to go to a place where there are already many hitchhikers? We want center of Europe, South or East?